still have my 2001 sunny brook. it is only a 25 foot unit, need a bit larger to retire in. but knock on wood and everything else, i have not had any real problems with it in all these years. 12 loving years and loyal to the end. I keep looking at newer FW's, but my little 2013 Jayco HT 26.5RLS has been to Alaska, YS, Black HIlls, and many other states. I've camped in 15 degree weather with no problems too. I just laugh when I see post that say the HT line of FW's are only good for nearby weekend trips. I would love to get a newer, and a little bigger unit, but will keep what I have for now. 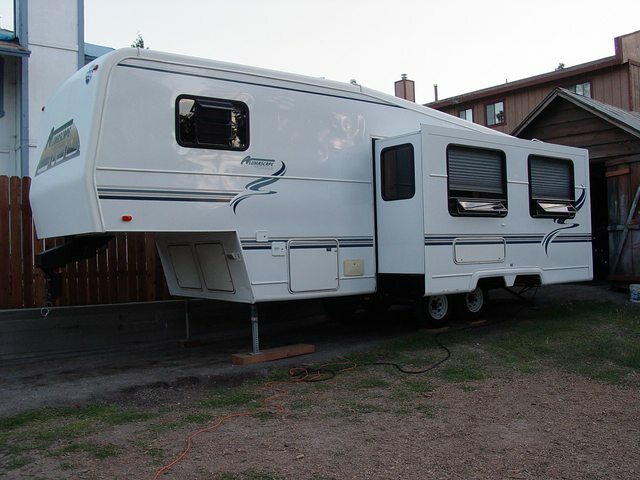 Dealer told me it went within 1 week..
We still enjoy going to the RV shows. We never see anything we would prefer over our current trailer. Some of the monster rigs are nice inside but they wouldn't gel with how we like to travel. All the bugs are worked out of our eleven year old trailer, now it's just hitting its stride. 2012 Dually Ram CCLB 4wd fully deleted/EFI tuned, BD Iron Horn and ebrake kits, custom hauler bed. WHOEVER INVENTED WORK DIDN'T HAVE AN RV! I think our favorite 5er was the HR 26RKS, we've seriously looked at getting another. That’s a great looking FW. I like the simplicity of the decals. Mine are in terrible shape, about the only thing I don’t like. Could easily and cheaper to put those stripes on when I get mine off. Those new RVs with all the scrolls and such don’t do much for me. I absolutely agree! Between the interior fabrics and the exterior graphics, I've often wondered if all the old acid-head hippies ended up at the RV mfrs. 1995 Dutchman,bought new in 95'. Made many improvements over the years made a lot of repairs. It's in good shape so we're keeping it. We have a 2005 NuWa HitchHiker II LS. Built like a tank. Just love it.